Employee theft, property crime and information security are the major security concerns of large U. S. companies, according to a survey reported by the American Society of Industrial Security (ASIS). 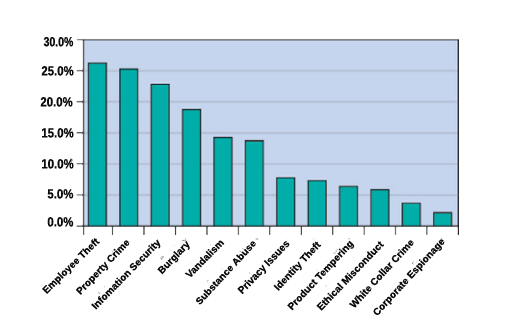 Burglary and vandalism ranked high as additional concerns (see Figure 1). For owners of commercial office properties, these findings translate to two priorities: keeping occupants safe and protecting buildings and contents. The importance of security can also be measured by the amount of money major companies have committed to it. The ASIS survey determined that respondents on average spent more than $1 million on security in 2004. Companies are spending this money on a variety of technology and equipment to increase safety and protect property. Computer and network security equipment lead the list, representing nearly 40 percent of all security purchases. An estimated one out of four surveyed companies also said they had purchased burglar alarms, fire protection systems, digital video recorder (DVR) surveillance and video cameras. Security lighting, access control, sensors and detectors, and badging/ID card printers were commonly purchased items as well. But are these investments the best way to increase security? These separate systems each address a different security need, and require training and familiarity to be most effective. A system that integrates the functions of many security devices into a single system significantly reduces capital expenditures and lowers facility operating costs because component devices are used in multiple ways and security officers can be trained on one system rather than many. Through integration, the whole security system becomes greater than the sum of its separate parts. strategic plans, financial data and research and development. Loss of information and intellectual property are not the only security concerns at commercial property. Violent crime near office buildings or in parking lots is also troubling. Year 2006 crime statistics from the FBI show the highest increase in the U.S. murder rate in major cities since 1991. In addition, news reports continue to focus on other critical concerns like large losses of personal data by both government entities and companies as well as the threat of additional terrorist attacks. In this environment, security will remain an important concern for building owners, operators and tenants. Manufacturers, mindful of these growing concerns will continue to offer an array of solutions, ranging from simple locks to complex biometric systems. Technological advances will also provide commercial office building owners and managers with even more innovative products to keep buildings and occupants safe. Increasingly, new security products are offering integration with other building systems as an important benefit. In fact, integration brings many advantages to building owners who understand that coordinating various security measures makes sense. Like all building investments, purchasing additional security systems must be justified and bring return-on-investment (either by loss prevention, premium rental income, or increased tenant retention). 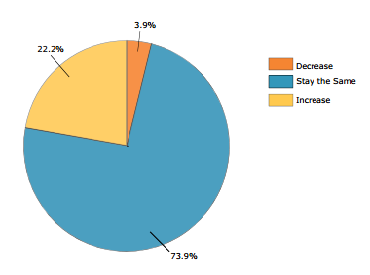 Seventy four percent of building owners surveyed by ASIS said they anticipate maintaining security expenditures at the present level in 2006. Hence, while security is important to commercial property owners, only about 22% of owners are increasing their spending. Purchasing a system with the most flexibility for integration lets management easily add components to increase security. Integration helps take full advantage of previously deployed sensors, cameras, and other devices. As a result, higher security can be achieved with the same budget year after year. Integration is the key enabler. competent and capable security staff, apply technology effectively to reduce crime and protect people and property. We will examine each system individually, and then in combinations to demonstrate how integrating security into the building automation system leverages these systems in multiple ways, increasing security and reducing operating and training costs. Simple intrusion detection is probably the most familiar concept of security to most people. Intrusion detection involves the use of door or window contacts, glass contacts, or motion sensors, in combination with some type of audible alarm that sounds when a person has forced entry into a building or room. An alert is sent to the police or security station to notify authorities of the time and location of the incident. Security officers respond in person to evaluate the situation. This method of incident response can be adequate for detecting an event and quickly getting to the scene. But the effectiveness of the response at the scene and subsequent prosecution is dependent on several things; the proximity of security personnel to the incident; whether witnesses were present; the number of people involved; the seriousness of the incident, and other factors. Furthermore, with simple intrusion detection, there is little in place that would deter people from committing a crime the first place. More information would be helpful, such as captured details of the situation that could lead to proper response and identification of perpetrators, thereby reducing the likelihood that a similar incident would occur again. Door and window contacts, motion sensors, and other devices already in use for alarming can be put to better use to help gather this information by triggering other parts of the security system. Access control is the means by which people are granted or denied access to restricted areas, such as office suites, storage facilities, or parking garages. Office buildings can either house individual tenants and companies in a multi-use property, or be owned and occupied by a single company. Varying degrees of access are required depending on use, and administration of access control for personnel can be distributed amongst several individuals. With different needs for owner-occupied and tenant-occupied buildings, how does management begin to evaluate the various types of access control systems that are available? Furthermore, in a growing and changing office environment, what is the best kind of access control to meet future needs? A flexible form of access control uses cards with magnetic card readers, proximity readers, barcodes, or smart cards with embedded microprocessors. Card access control at many large office buildings is common today, and there are a variety of systems with different levels of sophistication. There are many advantages to card access control. Employees can be coded with access to specific areas depending on their need, company affiliation, or any number of factors. Individual privileges can expire on a given date if desired. And in areas where tighter security is required such as labs or IT rooms, management can install keypads, keypad/card combinations, or biometric devices that can scan fingerprints or handprints. When used as a stand-alone system, card readers and other electronic access devices offer a cost-effective and flexible way for owners of office buildings to control who has access to the various areas, with the system recording who has gone where, and when. The sequence of operations is for the access device to trigger the door lock, entry is granted, and the event is recorded by the central system. But if a device can trigger the lock, why not use this inherent ability to trigger other security devices as well? As a standalone system, access control does its job, but does not fully leverage the connected sensors for broader security objectives. Video surveillance has evolved significantly in the last decade. Older video systems needed banks of video tape for continuous recording, and required manual administration to swap tapes periodically during the day. Record keeping was prone to errors and finding specific incidents on tape was time-consuming. Digital Video Recorders (DVRs) made significant advances in features and functions, taking advantage of fast computer processors and high density storage media to digitize, compress and record video from analog cameras. Newer cameras today have embedded processors that enable video to be compressed within the device and transmitted real-time over IP networks to Network Video Recorders (NVRs) that centrally manage video feeds from many IP cameras. DVRs and NVRs have many advantages over older analog recording technology. Streaming video can be continuously recorded and discarded in cycles of days, weeks, or months if no security incidents occur. If an incident does occur, disk indexing and time-stamping make it simple to find video from a given date and time. In addition, because the video is digitized, it can be exported and distributed via email or backed up on CD, DVD, or other digital media using common computer backup programs that are widely available. Digital video surveillance is cost-effective and sold by many vendors in a highly price-competitive market. If purchased as a separate system to meet the needs of a security plan or upgrade, a DVR or NVR may be adequate for immediate surveillance objectives. But if this digital video recorder is integrated with an organization’s access control and intrusion detection system (as part of the broader building automation system), the user improves surveillance and reduces the need for additional security personnel. Integrated with access control, video verification, for example, allows a user to see live video as well as the cardholder’s picture when a given access card is presented at a reader. The security staff can verify that the person presenting the badge is the actual cardholder. Another example of video verification effectiveness occurs in identifying individuals who are “tailgating,” or when one person swipes their badge and gains access to the facility and another person follows them in without presenting their badge. The integrated system allows organization to visually identify, verify and capture security breaches at access points. The advent of video analytics brings additional flexibility and increased productivity of security staff that monitor many cameras. 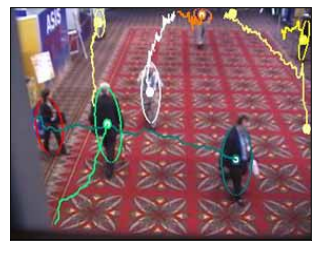 Video analytics is a technology applied in software that examines the video camera’s field of view for patterns of movement that match real-life events, such as falling, fence climbing, lurking, and trip-lines. Video analytics provides a means by which the user can focus only on what is truly important, managing surveillance by exception events rather than all events. A DVR or NVR can be configured to only display a camera’s video if a specific event or alarm occurs. At an office for example, foot traffic on a sidewalk near a back entrance may be deemed normal, and not trip an alarm according to video analytics assessment. However, stepping off the sidewalk and crossing left-to-right across the field of view to a window or restricted-access door may trigger an alarm. Additional alarms can be escalated if video analytics detect loitering near the window, or someone climbing a fence. These are examples of how expanded use of video surveillance technology can increase security at office buildings without requiring an increase in security personnel. Today’s access control and video surveillance systems can work together in an integrated BAS to provide a holistic solution at commercial office buildings. Keeping intruders away from property, limiting access to facilities that house expensive equipment, and remotely monitoring secluded areas to reduce the risk of crime. This is why more and more offices now rely on CCTV as part of their overall security solution. Using an integrated system, security staff at a central monitoring station can view live images from surveillance cameras, control pan-tilt-zoom cameras, or search for video clips stored on digital video recorders (DVRs). When an alarm is triggered by another part of the BAS, it can command the DVR to begin recording, display live video from a linked camera at the location, map the alarm location, and send an e-mail to an administrator all at the same moment. CCTV cameras are an important security component at office buildings, in hallways and parking areas. With an integrated approach, when an employee contacts security, lights and surveillance cameras can be activated to monitor the scene to observe the emergency, and officers can pinpoint where to intervene to thwart an attack. 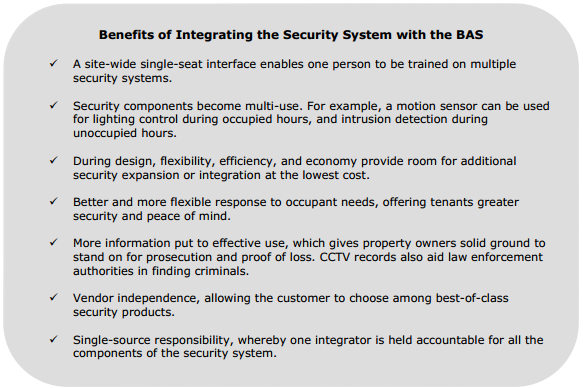 For owners of commercial office properties and the companies and tenants that work in these buildings, integrating the security system with the BAS offers numerous advantages. Foremost, integration provides for reduced installation and operating costs because it eliminates component redundancy and allows customers to streamline operations. Furthermore, it reduces training and empowers system operators by allowing them to perform their duties more efficiently. Enhanced safety, security and comfort for building occupants can also have a direct and positive impact on work efficiency. Such integration supports the goals of building owners and their tenants to be more productive, profitable and agile. Changes in how and where companies do business, along with rapid technological advances, are driving innovations in the security and BAS industries that are beginning to impact commercial office buildings as well. These forces of change are moving in the direction of integration and convergence of technology, including BAS, security systems and IT networks. Important trends driving change are the convergence of the enterprise network and the building’s IT network. This is created by the need to share corporate information, such as human resource facility data, with the security staff and other groups within an organization.In addition, owners of multiple commercial properties want to interconnect facilities spread over different geographical locations to access real-time data over the Internet. This information can be used for remote monitoring, facility management, analysis and control. Using one, integrated system reduces overall hardware and software requirements, including the number of workstations needed on the operator’s desktop. It also causes fewer training issues, lowers training costs, and reduces the number of staff required to effectively and efficiently manage many buildings. All of these benefits ultimately result in an increased return-on-investment for a building’s owner. A well engineered and maintained building automation system provides a solid return on investment over many years and delivers the highest level of security. The best security in commercial office buildings involves more than just good choices of alarm systems, cameras, and other security devices. A security system integrated into a flexible and scalable building automation system allows the building owner to use multiple security systems at once, expand applications of security for least cost, and protect the security system capital investment from becoming obsolete in the near future. An integrated building automation system should not be confused with separate security systems that have been linked together by interfacing various manufacturers. An integrated BAS helps the building owner adapt to changing uses of the building and also enables additional control applications linked to security that involve HVAC, lighting, elevator control, and other systems in the building. Choose the best security components from multiple manufacturers, and have an integrated BAS solution provider like Ascendo design them into a cost-effective security application to meet your current and foreseeable plans for the property. The best plan for maximum security is a blending of physical security, policies and procedures, as well as technology to obtain a safe and secure environment.